Miranda Pfeiffer is an artist, animator, and writer, born in Charlotte, North Carolina. 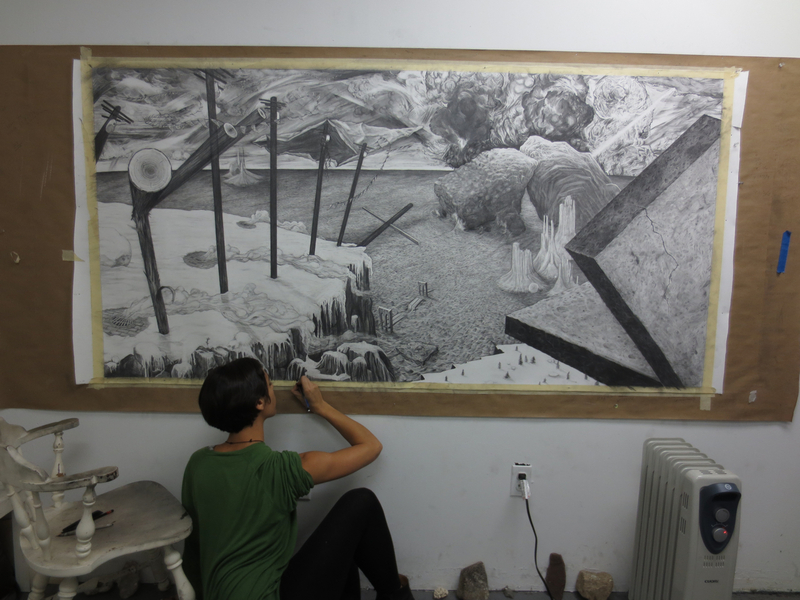 After attending the Maryland Institute College of Art for a BFA in Interdisciplinary Sculpture, she made the leap, and now considers Baltimore her home. Pfeiffer’s animations are a series of hand-drawn watercolor frames on semi-translucent cels. Corralling an array of non-traditional animation tools, she creates quiet sequences, questioning minute environmental interactions within a larger social context. Her films have appeared in the Maryland Film Festival, Receiver Fest in South Carolina, and The Northside Film Festival in Brooklyn. She has also directed animated music videos for the bands Celebration and Soft Cat. 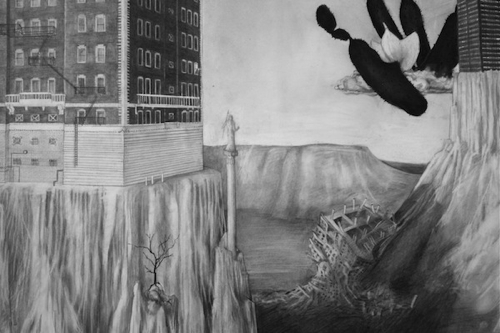 In conjunction with films, Pfeiffer creates large-scale graphite drawings. 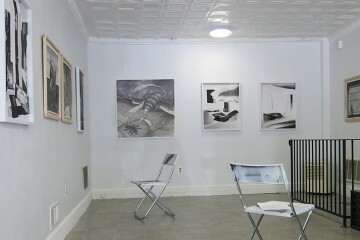 Though rendered in miniscule mechanical pencils, many of these drawings span over ten feet long. She spends her free time tending to Baltimore gardens, keeping bees, and taking long walks across brick-filled alleyways. These urban interactions inspire her work. In 2011, Pfeiffer received a Chair’s Prize from the Maryland Institute College of Art. The grant funded a visit to South Korea to complete a series of animations onsite, atop the mountains of Seoul. 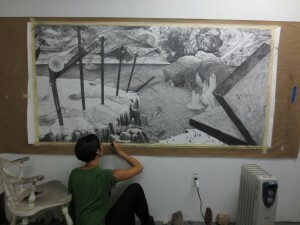 In 2012, The William G. Baker, Jr. Memorial Fund awarded Pfeiffer a B-Grant, culminating in an exhibition of large-scale graphite drawings at the Baltimore Museum of Art. Following this, the Baker Fund awarded Pfeiffer the Nancy Harrigan Prize. 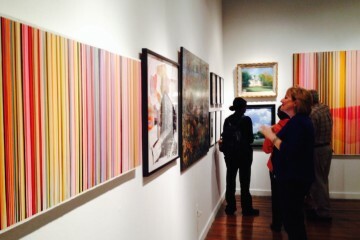 Recently, Pfeiffer has exhibited at The Creative Alliance in Baltimore, MD, The Exquisite Corpse Gallery in Kalamazoo, MI, and The Cambridge Art Association. 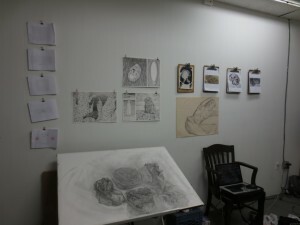 Pfeiffer’s drawings appear within the Drawing Center’s curated slide registry. She is a frequent contributor to such publications as Schematic Quarterly and Spiral Cinema’s Video on Paper, as well as a member of Current Space, an artist-run gallery located in downtown Baltimore. Christine Bergeron: I saw that you graduated from MICA in 2011. What was your major? Miranda Pfeiffer: Even though I’ve never diverted much from two-dimensional work, I was actually a Sculpture major when I graduated. I started out as Illustration major because I used to make comic books, somewhere in between, I was a General Fine Arts major for a semester, too. CB: How was your overall college experience? Do you feel like MICA really benefitted and shaped you as an artist? MP: Yes, I do feel like I got a lot out of MICA. MICA is especially one of those schools where you only get out what you put into it. I can’t stress that enough. It’s so important to really appreciate the time a school like that gives you, and to take advantage of whatever resources make the most sense for you. CB: What were the first few months after graduation like? Did you feel prepared or was there any kind of downtime or break afterwards? MP: I completely freaked out after I graduated. By the January before my graduation came around, it was still a little abstract to me what life outside of school meant. Even while in school, I was starting to get really nervous, but I cared a lot about my thesis work too. It was confusing. Oh man, that final semester got so intense. Final crits got really accusatory. Everyone was pushed to their limits. As students, we focused so much on the so-called integrity of what we were doing. Art was a huge ethical question, intermeshed with essays and theory. Then I graduated and there was no support and community. There were no voices. Suddenly, integrity had this real life application, and in turn it mattered a lot less in that theoretical institutional way. Then, in the months after I graduated, I went through this dark phase where I didn’t have any money and it was like month to month. It took a long time before I felt allright, if I even feel that way now. CB: Were you working a day job while making work? MP: I was living on $600 a-month on my part time job and I did a lot of freelance work to extend that amount. Honestly, that was nearly impossible, and being unsure of how I’d pay rent definitely contributed to my ‘dark phase.’ To step out of that hole, I took this terrible terrible awful job as a digital imaging contractor. I made databases for people. It was the most boring work of my life. There were no windows in the office and I was face to face with a pretty oppressive side of the corporate world. The only good thing was I got paid $16 an hour to do it. In hindsight, it was actually really good for me go in such a demoralizing professional direction for a while. It was the kind of thing that when I was in school I would have said, “No way would I ever let my life look like that.” Then suddenly, to stay afloat I had to make those kinds of decisions. Although I in no way thought this at the time, I can now see that it helped me to have faith that I can survive a lot, too. I remember around this time, my peers and I would have conversations like, “I feel like I graduated with no real skills.” I did though. Art school is great for that. It just takes time for those to manifest them in the non-school world. 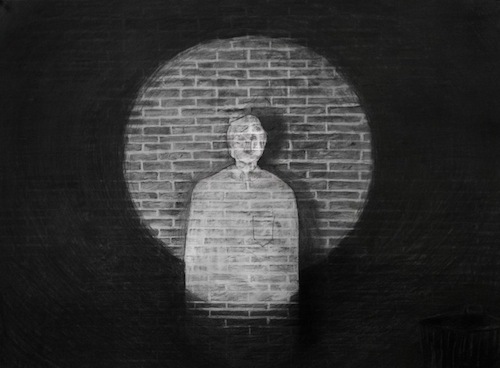 Also, around this time, I worked on Matt Porterfield’s film, “I Used To Be Darker” that just premiered at Sundance. I was the lead make-up artist, which was something I’d never done before. While working on the movie set I started drawing again because you can’t really talk while they are filming. I hadn’t done graphite drawings since early high school. I would bring a little notepad to set and draw the things around me and the things I was imagining. After work I started to draw more, too. That was the beginning. CB: Did you immediately rent a studio and continue exhibiting your work? MP: At that point I was just drawing in my living room on these giant pieces of paper and my friends would invite their friends over and it became this big social space. There’d be people hanging out on my couch drinking beer and listening to music all while I was drawing across the wall. Sometimes I got really angry. I can’t believe my roommates let me work there! I guess I’m pretty lucky to have had the wall-space to make that work at all, though. Around early December good things started to happen. I got a grant from the Baker Artist Awards. Then I got a show at the BMA which was huge because I felt very anonymous at this point. It was weird to be recognized all of a sudden. Then I got a new day job at the local bakery, Charm City Cakes. It’s a much more positive work environment than the database job. I work in their office doing a bit of bookkeeping, client-communication, and even designing cakes. CB: Could you tell me about your work? MP: Right now one of the drawings I have hanging up is going to be a study of a building on North Avenue that is not traditionally beautiful, like say, the Belvedere. The building on North was designed with few aesthetic flourishes, mostly so it could hold a lot of people, as if the people living inside wouldn’t need those details. A lot of my work is articulated from a Baltimore landscape. A lot of my work is about trying to conceive of a future Baltimore that could also look like a timeless past. I’ll pick up a rock or hunk of concrete and take it back to my studio to draw. I really care about Baltimore and think it’s a very special place. All four years I went to MICA, I thought Baltimore was the craziest city in America. I remember seeing a man dispose of his florescent light-bulbs by beating them with a two by four into a public trash can, spraying glass all over the street and cars near by. He shoved them in the can and fled the scene. That’s an example of the kind of thing I used to think, “Man, only here, where we’re all so thoughtless and nothing makes sense.” Now, it’s kind of funny because in other towns, I feel fuzzy. If I go to a place where you aren’t faced with that kind of grit on a daily basis, I really question it. I usually assume it’s there somewhere, just kept out of view. And there are plenty of places in America where you can drive for miles and not come face to face with that kind of oddity. I’m proud to be in communication with it. It’s nothing I want to idealize, but Baltimore has helped me develop a profound, not sugar-coated experience of life. I’m also working on this drawing of dead roses that is an intense practice of pure observation and I don’t know where it’s going or whether it’s even going to be a good drawing. Roses are kinda cheesy, right? This other piece I’m working on is a continuation of other landscapes. Its inspired by the winter, and there will be giant slabs of concrete jutting out from the sides of the canvas. I seem to make one of these really giant landscapes for every season. CB: Has your work changed and developed a lot since graduating in terms of style and the kinds of themes and ideas you work with? MP: The ideas are not completely different. I still feel like what I said in my thesis essay from college called “Voids of Dogville” is the heart of what I’m doing now. I have to admit I’m a narrative thinker too. That hasn’t changed. I feel very different from college because there’s something about being able to support yourself financially. My entire life structure changed. That has to influence the work somewhat. 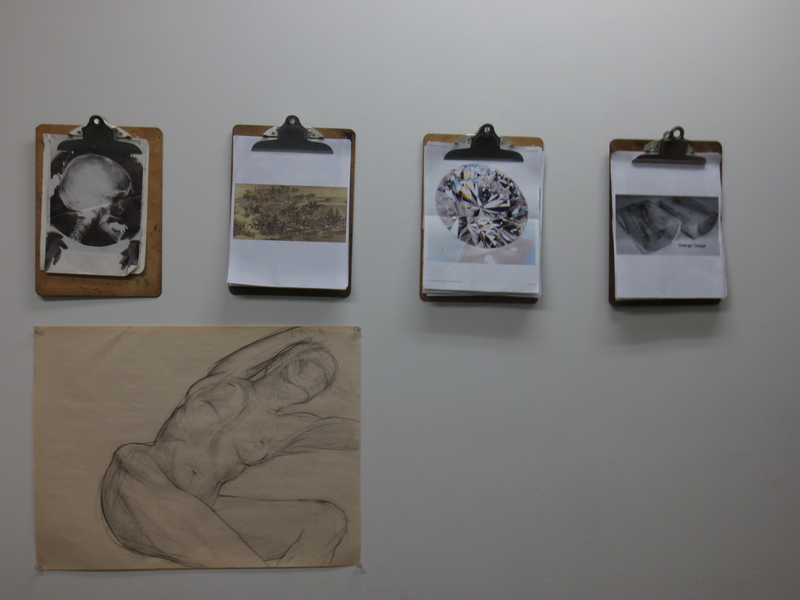 My drawing style was very much inspired by the IS (Interdisciplinary Sculpture) department. 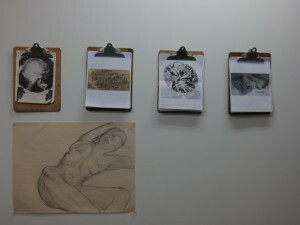 I approach graphite and paper in the same way contemporary sculptors approach their materials. I’ve always fit in well with new media artists, rather than traditional render-er types. Either them or old-school Chinese calligraphers. I think I have realistic expectations of what language can say about any type of art. I think I’m a lot more intuitive than I was in school. For some reason, as counter-intuitive as it sounds-I couldn’t imagine making a drawing in art school. I think I always wanted to push the envelope and do something ‘groundbreaking.’ Now, I’d rather be observant of objects and rendering them in a style that honors them. When I was in school, the City Paper once called my work ‘Naval Gazing.’ To this day, I still wonder if that was true, or if I’ve changed at all since then. CB: Could you describe a typical day for you? There’s usually some freelance pieces floating around, too. Right now I’m creating a wallpaper for a family friend’s law firm in New Jersey. I’m making the stencil right now. It’s basically just a tree with birds, nothing like what I would normally make! I’m also working on an album cover for my friend Lorely Mac who goes by Empress Of. This kind of work keeps me honest in a different way than the normal 9-5. CB: Have you considered going to grad school in the future? How about residencies? MP: Yea, in August I’m going to Korea to fulfill a grant to make an animation on a mountaintop. That’s kind of like a residency, right? I’m not applying to residencies at the moment. Unfortunately my day job doesn’t really leave much time for them. Next ten years… yea grad school. Some day, I want to teach and so I give a lot of artist talks. It’s a great place to test out that interest in teaching. I wouldn’t want to go to grad school unless I didn’t want to teach. Even then, I have so many reservations with how expensive it is, how saturated the MFA market is. In our economy, I don’t know if it still makes as much sense to get a masters degree in art. I’m pretty confused on the whole thing, actually. Do you have any advice? Like the grad school question, there are still so many questions I still have about how to do this whole art thing. But god, someday I would kill to design curriculums, probably either in animation or drawing. CB: Could you tell me more about your animations? MP: It’s mostly 2D and stop motion with some collaging thrown in. I also do a good bit of cel by cel animation, but I don’t do it the way Disney does it. I always use very messy materials. Because of this, the frames don’t track smoothly. The final result contains a lot of movement and traces of the hand. I’ve been doing a few cel by cel animations lately with Sumi ink. Those jump around a lot! The medium is very unpredictable. A few years ago, I worked with a traditional Korean calligrapher, so it probably comes out of that time in my life. I used to use vellum for the frames, but now I use tracing paper because it shows more of the texture of the paper. Currently, I’m working on a few animations of these rocks running with horse’s legs. I did a big drawing of these rock-guys too. (An Aeon of Hurtling Bodies) To animate, I scan in each cel manually and I edit them in Final Cut. Like the drawings there’s a very tedious, repetitive nature to the work. The time it takes to make the animations depend on the style and story. “Food for Worms” took me 6 months. I’ve worked for clients too, though mostly with small bands I like. I’ve done music videos for the band Soft Cat, a film screening promo for an Outdoor Film series in Baltimore, and whole slew of animations and posters for Celestial Shore, a band in Brooklyn. CB: What are the benefits of having a studio in a collective space rather than just working from home? Is there a strong sense of community or does everyone mostly keep to themselves in order to preserve ideas? MP: Working here isn’t collaborative but there’s a sense of others presence. Andrew and Mike coordinate Current and a lot of different people come through the space. James Bouché began running the screen-printing studio this summer and Ginevra Shay is starting a communal dark room. That said, Current is very individualistic. For example, a place like Open Space is much more truly collective, voting together on which shows they exhibit. I like to keep my door open so people can come through say hi and see what I’m working on. I’ve had great conversations this way. Oh also, it’s great to have a place to hold a studio visit. I tried to have a few in my house. I remember, it was slightly awkward when Ann Shafer and Ben Levy from the BMA came last year to see my living room studio. All my roommates were running around the drawings, making noise and answering their phones. It was chaos. I actually helped renovate the gallery here at Current years ago when it was just an abandoned unemployment agency. In May, I got a space here. 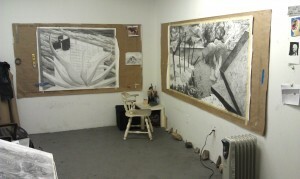 My friend Skye Gilkerson had the studio I’m in. Honestly, I wasn’t looking for a studio, but when I heard she was leaving I instinctively jumped on it, figuring it would have some of her good mojo, and thinking it would help me mentally to finally have a space just for art-making. It’s a sweet studio, too. A bit like a cave and pretty cold some nights, though. Unfortunately, having a studio means I spend less time each week working. It was just a hell of a lot more convenient when the drawings were in my living room. However, I find that the actual quality of the time I spend is much more focused. I recommend that most artists at this stage in their career get a studio (if they can afford it!). It’s a helpful tool to concretize your practice. CB: What are some of your future goals? MP: Draw bigger and bigger with smaller and smaller pencils. Finally figure out how to affordably frame and transport the work. In my truest fantasy I’d love to be able to do this work full time. I think I’m constitutionally set up for it. I’m very disciplined, and I can handle working alone for long periods of time. Second, I do see myself teaching in the next 10-15 years, but it’s nothing I’m rushing into. CB: Do you have any advice for a soon-to-be-graduate? What to do and what not to do? MP: I can guarantee you it’s going to be okay. I don’t know why you should believe me, but it just is. It’ll work out so just keep going. Try to think without judgment about work you want to be making. If you find yourself not making work right after graduation don’t be hard on yourself, but the more you can work the better. Also, splurge on a high quality pen if it’s going to help you write down your ideas. Finally, it’s so important to love what you’re doing while you’re doing it. This is an impossibly hard career choice. I think after graduation, a lot of people realize that actually making the art–not necessarily having the art finished and in a gallery–is not what brings them joy. That’s fine! Have no shame. Just listen to yourself. If it is what you love, then remember, just keep doing it. That’s your goal–to be engaged in the work. Author and Interviewer Christine Bergeron is a senior GFA major at MICA, and will graduate with a concentration in Illustration in May, 2013. Bergeron’s current work uses distortion, optical illusions and vibrating color combinations paired with aspects of traditional portraiture to create a sense of visual overload and optical hyper-stimulation. She currently lives and works in Baltimore, Maryland.